The exterior of the Buffalo Exchange store at 1520 Chestnut St. in Philadelphia. If you're ready to refresh your wardrobe for spring, make sure to take note of this upcoming event. All Buffalo Exchange locations, excluding outlets, will host the chain's annual Earth Day $1 Day Sale on Saturday, April 20. 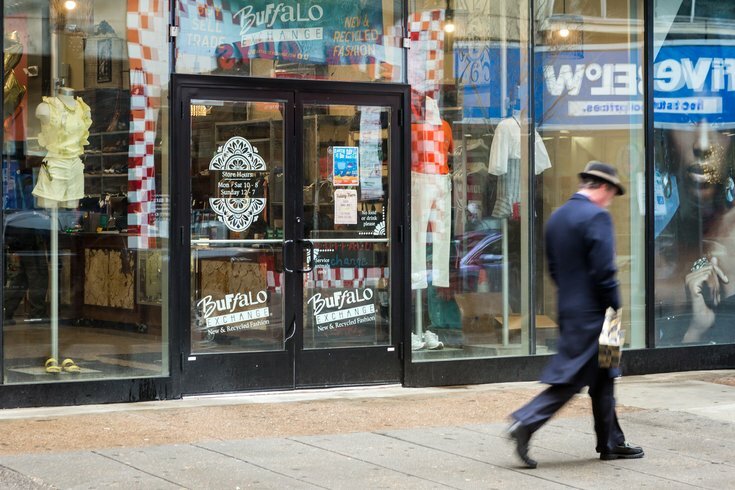 In Philly, there's a Buffalo Exchange at 1520 Chestnut Street. Buffalo Exchange stores, which buy, sell and trade vintage and used clothing, will offer a selection of men's and women's clothing, shoes and accessories for $1 apiece. Before shopping, just remember the sale is cash only and items are expected to sell fast. Buffalo Exchange advises shoppers to arrive early with dollar bills in hand. Since the Earth Day $1 Day Sale started in 1997, it has been the resale chain's most popular event. This year, the organization benefitting from the $1 sale is the the Human Society, which helps rescue animals from natural disasters and abusive conditions. All proceeds will go to the nonprofit.